For other uses, see Rollo (disambiguation). Rollo on the Six Dukes statue in Falaise town square. Rollo (c. 846 – c. 930) was a Viking who became the first ruler of Normandy, a region of France. He is sometimes called the 1st Duke of Normandy. Rollo emerged as the outstanding personality among the Norsemen who had secured a permanent foothold on Frankish soil in the valley of the lower Seine. Charles the Simple, the king of West Francia, ceded them lands between the mouth of the Seine and what is now the city of Rouen in exchange for Rollo agreeing to end his brigandage, and provide the Franks with protection against future Viking raids. Rollo is first recorded as the leader of these Viking settlers in a charter of 918, and he continued to reign over the region of Normandy until at least 928. He was succeeded by his son, William Longsword in the Duchy of Normandy that he had founded. The offspring of Rollo and his men became known as the Normans. After the Norman conquest of England and their conquest of southern Italy and Sicily over the following two centuries, the descendants of Rollo and his men came to rule Norman England (the House of Normandy), the Kingdom of Sicily (the Kings of Sicily) as well as the Principality of Antioch from the 10th to 12th century, leaving behind an enduring legacy in the historical developments of Europe and the Near East. The Savoy dynasty family built a castle in Switzerland which was called castrum de Ruello in 1295 AD which is thought to have been named in honor of Rollo. Rollo was born in the latter half of the 9th century somewhere in Scandinavia. He is first mentioned in historical sources as a leader of the vikings who besieged Paris in 885–6. The earliest known source to mention Rollo's origins is the 10th century French chronicler Richer of Reims, who claims that Rollo was the son of Ketill – possibly the same Ketill whom Richer names as the leader of subsequent Viking raids on the coast, between the Seine and the Loire, in 888. Subsequent medieval sources claim either Norwegian or Danish origins for Rollo. Most modern historians tend to prefer sources stating that Rollo had Norwegian origins. The first known biography of Rollo, Historia Normannorum (or Libri III de moribus et actis primorum Normanniae ducum), written by the cleric Dudo of Saint-Quentin in 994, was commissioned by Rollo's grandson, Richard I of Normandy. While it is presumed that Dudo had access to family members and people with a living memory of Rollo, although this advantage must also be weighed against potential political biases, as an official biography. Dudo claims that Rollo was Danish, making a distinction between Denmark and the Scandinavian peninsula. According to Dudo, a king of Denmark was antagonistic to Rollo's family, including his father, an unnamed Danish nobleman and Rollo's brother Gurim. Following the death of their father, Gurim was killed and Rollo was expelled from Denmark. Dudo was the main source for William of Jumièges, writing after 1066, and Orderic Vitalis, during the early 12th century, though both include additional details. The first source to claim a Norwegian background for Rollo is Geoffrey Malaterra, an 11th-century Benedictine monk and historian, who wrote: "Rollo sailed boldly from Norway with his fleet to the Christian coast." Likewise, the 12th century English historian William of Malmesbury stated that Rollo was "born of noble lineage among the Norwegians". In The Life of Gruffudd ap Cynan, an anonymous 12th-century Welsh author claims that Rollo was a brother of a contemporary, King of Norway, Harald Finehair. The 13th century Icelandic sagas, Heimskringla and Orkneyinga Saga, identify Rollo with Hrólfr Rognvaldsson – Hrólf the Walker (Ganger-Hrólf), so named because he "was so big that no horse could carry him". The Icelandic sources claim that Hrólfr was born in Møre, western Norway, in the late 9th century and that his parents were the Norwegian jarl Rognvald Eysteinsson ("Rognvald the Wise") and a noblewoman from Møre named Hildr Hrólfsdóttir. The name "Rollo" has generally been presumed to be a Latin translation from the Old Norse name Hrólfr, (cf. the latinization of Hrólfr into the similar Roluo in the Gesta Danorum), but Rollo could be a Latin version of Hrollaugr. The name is given as Roul in the 12-century Norman French Roman de la Rou by Wace, commissioned by Henry II of England, descendant of Rollo. Dudo records that Rollo took the baptismal name Robert. The byname Göngu-Hrólfr does not appear in Norman sources, but only in later Icelandic sagas, and depends upon the conflation in these sagas of the Norman Rollo with a Norwegian character. Dudo tells us that Rollo seized Rouen in 876. He is supported by the contemporary chronicler Flodoard, who records that Robert of the Breton March waged a campaign against the Vikings, who nearly levelled Rouen and other settlements; eventually, he conceded "certain coastal provinces" to them. According to Dudo, Rollo struck up a friendship in England with a king that Dudo calls Alstem. This has puzzled many historians, but recently the puzzle has been resolved by recognition that this refers to Guthrum, the Danish leader whom Alfred the Great baptised with the baptismal name Athelstan, and then recognised as king of the East Angles in 880. Dudo records that when Rollo took Bayeux by force, he carried off with him the beautiful Popa or Poppa, a daughter of Berenger, Count of Rennes, took her in marriage and with her had their son and Rollo's heir, William Longsword. There are few contemporary mentions of Rollo. 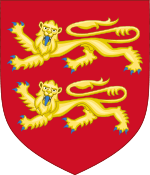 The earliest record is from 918, in a charter of Charles III to an abbey, which referred to an earlier grant to "the Normans of the Seine", namely "Rollo and his associates" for "the protection of the kingdom." Dudo retrospectively stated that this pact took place in 911 at Saint-Clair-sur-Epte. In return for formal recognition of the lands he possessed, Rollo agreed to be baptised and assist the king in the defence of the realm. Rollo took the baptismal name Robert. The seal of agreement was to be marriage between Rollo and Gisla, daughter of Charles. Dudo claims that Gisla was a legitimate daughter of Charles. 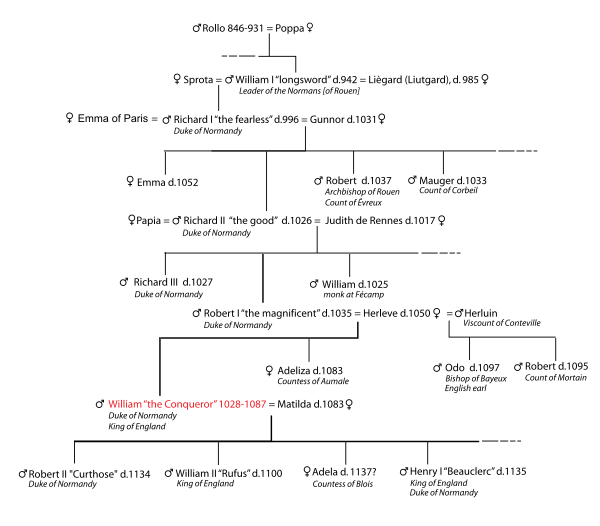 Since Charles first married in 907, that would mean that Gisla was at most 5 years old at the time of the treaty of 911 which offered her in marriage. It has therefore been speculated that she could have been an illegitimate daughter. However a diplomatic child betrothal need not be doubted. After pledging his fealty to Charles III as part of the Treaty of Saint-Clair-sur-Epte, Rollo divided the lands between the rivers Epte and Risle among his chieftains, and settled with a de facto capital in Rouen. Charles was overthrown by a revolt in 923, and his successor, Robert of Neustria, was killed by the Vikings in 923. His successor, Ralph, conceded the Bessin and Maine to Rollo shortly afterwards, the chronicler Flodoard tells us. Rollo's son and heir, William Longsword, and grandchild, Richard the Fearless, forged the Duchy of Normandy into West Francia's most cohesive and formidable principality. The descendants of Rollo and his men assimilated with their maternal Frankish-Catholic culture and became known as the Normans, lending their name to the region of Normandy. Rollo is the great-great-great-grandfather of William the Conqueror, or William I of England. Through William, he is one of the ancestors of the present-day British royal family, as well as an ancestor of all current European monarchs and a great many claimants to abolished European thrones. 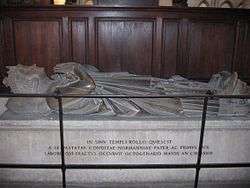 One daughter of Rollo, Gerloc (also known as Adele), who married William III, Duke of Aquitaine, was mentioned by Dudo. According to William of Jumièges, writing in the latter-half of the 11th century, Gerloc's mother was named Poppa. According to the medieval Irish text An Banshenchas and Icelandic sources, another daughter, Cadlinar (Kaðlín; Kathleen) was born in Scotland (probably to a Scots mother) and married an Irish prince named Beollán mac Ciarmaic, later King of South Brega (Lagore). A daughter of Cadlinar and Beollán named Nithbeorg was abducted by an Icelandic Viking named Helgi Ottarsson, and became the mother of the poet Einarr Helgason and grandmother of Guðrún Ósvífrsdóttir (protagonist of the Laxdœla saga). Rollo is the subject of the seventeenth century play Rollo Duke of Normandy written by John Fletcher, Philip Massinger, Ben Jonson, and George Chapman. A character, loosely based on the historical Rollo and played by Clive Standen, is Ragnar Lothbrok's brother in the History Channel television series Vikings. ↑ David Bates Normandy Before 1066 (Longman 1982), pp. 8–10. ↑ Francois Neveux and Howard Curtis, A Brief History of the Normans: The Conquests that Changed the Face of Europe, Robinson 2008. ↑ Robert Ferguson, The Hammer and the Cross: A New History of the Vikings (2009), pp. 177-182. ↑ Dudo of St. Quentin, History of the Normans. ed. and trans. Eric Christiansen. Woodbridge, Suffolk: The Boydell Press 1998, chap. 5. Dudo's terminology is confused. He uses Scandia for the Scandinavian peninsula and Dacia for Denmark, apparently under the impression that the Danes hailed from Dacia originally. ↑ Robert Ferguson, The Hammer and the Cross: A New History of the Vikings (2009), p. 177. ↑ Sharpe, Rev. J. (trans. ), revised Stephenson, Rev. J. (1854) William of Malmesbury, The Kings before the Norman Conquest (Seeleys, London, reprint Llanerch, 1989), II, 127, p. 110. ↑ The history of Gruffydd ap Cynan", the Welsh text with translation, introduction and notes by Arthur Jones. Manchester University Press 1910. ↑ Robert Ferguson, The Hammer and the Cross: A New History of the Vikings (2009), p. 180. ↑ The Normans in Europe, trans and ed. Elizabeth Van Houts (Manchester 2000), p. 43. ↑ Dudo of St-Quentin: History of the Normans, trans. and ed. Eric Christiansen (Woodbridge 1998), p. xiv; Robert Ferguson, The Hammer and the Cross: A New History of the Vikings (2009), pp. 177-182. ↑ The Normans in Europe, trans and ed. Elizabeth Van Houts (Manchester 2000), p. 25. ↑ Dudo of St-Quentin: History of the Normans, trans. and ed. Eric Christiansen (Woodbridge 1998), pp. 46-47. ↑ Ferguson 2009, p. 187. ↑ Pierre Bauduin, Chefs normands et élites franques, fin -Début siècle, (181-194), in Pierre Bauduin (éd. ), Les Fondations scandinaves en Occident et les débuts du duché de Normandie, Publications du CRAHM, 2005, p. 182. ↑ David Bates Normandy Before 1066, pp. 20–21. ↑ Eleanor Searle, Predatory Kinship and the Creation of Norman Power, 840–1066 (University of California Press, Berkeley, 1988), p. 89. ↑ Norsk biografisk leksikon (1921-1982), grunnlagt av Edv. Bull, Anders Krogvig, Gerhard Gran, (19 volumes. Oslo : Aschehoug, 1921-1982), FHL book 948.1 D36n., Vol 4, p. 351-353. ↑ The Vikings (1972), La Fay, Howard, (National Geographic Society Special Publications. Washington: National Geographic Society, 1972), JWML book DL65 .L3., p. 146, 147, 164-165. ↑ "Viking is 'forefather to British Royals'". Views and News from Norway. 15 June 2011. Retrieved 15 June 2011. ↑ "Was Viking Ruler Rollo Danish or Norwegian?". The Local. 2 Mar 2016. Retrieved 6 Oct 2016. ↑ Turnbow, Tina (18 March 2013). "Reflections of a Viking by Clive Standen". Huffington Post. Retrieved 19 March 2013. Wikimedia Commons has media related to Rollo of Normandy. Dudo of St. Quentin, History of the Normans. ed. and trans. Eric Christiansen. Woodbridge, Suffolk: The Boydell Press 1998. The Gesta Normannorum Ducum of William of Jumièges, Orderic Vitalis and Robert of Torigni ed. Elizabeth van Houts (1992). The Normans in Europe transl. and ed. Elizabeth van Houts, Manchester and New York: Manchester University 2000. Orkneyinga Saga: The History of the Earls of Orkney. Trans. Pálsson, Hermann and Edwards, Paul. Hogarth Press, London, 1978. ISBN 0-7012-0431-1. Republished 1981, Harmondsworth: Penguin. ISBN 0-14-044383-5. Christiansen, Eric (2002). The Norsemen in the Viking Age. Blackwell Publishers Ltd.
Ferguson, Robert (2009). The Hammer and the Cross: A New History of the Vikings. London. Allen Lane, an imprint of Penguin Group. Fitzhugh, William W. and Ward, Elizabeth (2000). Vikings: The North Atlantic Saga. Smithsonian Institution Press.